IBS is a disease fraught with multiple symptoms. Abdominal pain is the overriding symptom that affects most people, but many also suffer from bloating, gas, diarrhea (called IBS-D), and constipation (called IBS-C). Living with this barrage of digestive problems leaves many people’s lives in shambles. Unable to get any peace or to eat and digest daily meals without pain, IBS sufferers often experience a poorer quality of life than those suffering from seemingly more serious conditions like heart disease or diabetes. Caught in this daily struggle, it isn’t long before someone with IBS could also end up fighting symptoms of anxiety and depression. Many admit that these can be two of the most challenging symptoms to deal with. When tackling the condition, however, most people are encouraged to focus on diet. Medical experts generally agree that finding out which foods trigger painful attacks is key to reducing the severity of symptoms. Keeping a food journal can help in this regard. For many, eating fatty foods makes their symptoms worse. Chocolate may be a problem food, as well as alcohol or sugar. Foods considered helpful are those high in fiber. A distinction is often made here between IBS-C and IBS-D. Those with IBS-C should include lots of foods high in insoluble fiber such as bran cereal, whole grain cereal, and lots of vegetables and fruits. For those with IBS-D, foods high in soluble fiber may offer the most help in alleviating symptoms. That means eating more oat bran, barley, psyllium husks, citrus fruits and legumes. Now, back to the issue of anxiety and depression: for those with IBS, going for a little cognitive behavior therapy can be beneficial too. In a recent clinical trial, researchers compared four specific strategies for managing IBS: stress management, psychodynamic therapy, cognitive behavioral therapy, and hypnosis. The research team found that stress management imparted modest benefits when it came to the physical symptoms, mental health symptoms, and quality of life of people. Cognitive behavioral therapy, on the other hand, showed consistent and significant benefits in terms of treating anxiety and depression. 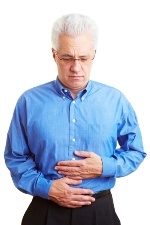 As for the digestive complaints of IBS, cognitive therapy had mixed and inconsistent results. Psychodynamic interventions reduced anxiety and depression but not IBS symptoms. And finally hypnosis, surprisingly, showed the most positive benefits in terms of disease severity. These study results may give you some much needed clues in how to best treat IBS. Hypnosis is not a commonly utilized treatment in the IBS community but it may offer hope for those where other conventional treatments have failed. Talk to your healthcare provider about any of these treatments if you’re struggling to manage your IBS symptoms. This may be just the help you are looking for to send you on the way to healing. Knowles, S.R., et al., “The Efficacy and Methodological Challenges of Psychotherapy for Adults with Inflammatory Bowel Disease: A Review,” Inflamm Bowel Dis. July 10, 2013. Holwegner, A., “Help Manage Irritable Bowel Syndrome with these diet strategies,” The Calgary Herald web site, March 27, 2013; http://www.calgaryherald.com/life/Help+manage+Irritable+Bowel+Syndrome+with+these+diet+strategies/8161461/story.html, last accessed July 15, 2013.